Toyota GT 86 video review | What Car? 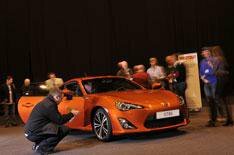 The Toyota GT 86 coupe looks set to be one of the most exciting cars of 2012, but see what members of the What Car? Reader Test Team thought about it when they were invited to preview it. We've also got videos of loads of other new-car previews we've invited our readers to. Take a look at the videos below. What do we think of the car?